These good folks have trusted me for the past six years to document their little family of four. We've all done a lot of growing in that time and I love them for sticking with me. Here's a peek at our Sunday morning together outside at the art museum. There's nothing I love more than photographing a family over and over as each year brings so much change and new growth. Being invited into a home to document real life, especially in the early days with a new baby, is a huge privilege. Here's a peek at my morning with Jennifer, Tripp and their little ones Evelyn and Parker. There's nothing I love more than photographing a wedding at home. Or anywhere special and purposeful for that matter but where's more special and purposeful than home? Betsy and John were married April 30 in the backyard of Betsy's family's beach home in Pine Knoll Shores. It was perfection. Not overblown perfection, but just comfortable dig-up-the-bourbon-under-the-porch perfection. A few images from this beautiful bride's portrait session at her aunt's home in Kinston. It was a relaxed, perfect evening. A crazy happy baby in a room full of sunlight is pretty much the best thing ever. Throw in two well-behaved dogs, a cat and a sweet mama and there's really nothing better. I photographed Courtney and her seven-month-old daughter Bonnie several mornings ago and everything about everything was a-okay. I love the connection that comes from photographing a family multiple times. It's always an honor to be asked back even once. This was my fourth time photographing Elise and Mitch's family - but my first for their new addition Adelaide. She was an absolute doll and already very very well loved - especially by big brother Webb. This girl, one of my favorite people since first grade who I used to do all sorts of hilarious and inappropriate things with, is having a baby! She's going to be the best mom ever and her sweet husband is going to be a really really great dad. I'm so happy for them and even happier that I had a chance to photograph them (visiting from Brooklyn) over the holidays. They call their baby-girl-to-be Dr. Z, so here's to the doctor! What an incredible year. Close to 60 families invited me into their homes (or similarly special places) to document their laughter, new babies, favorite toys, vegetable gardens, pets and, most importantly, their love for one another. My goal with every family session is to capture these ordinary things in the most real and beautiful way I know how. Often that means showing the wrinkles, messy playrooms and scabs. Authentic storytelling is my jam and I am eternally grateful to the people, my clients and friends, who trust me with their stories. 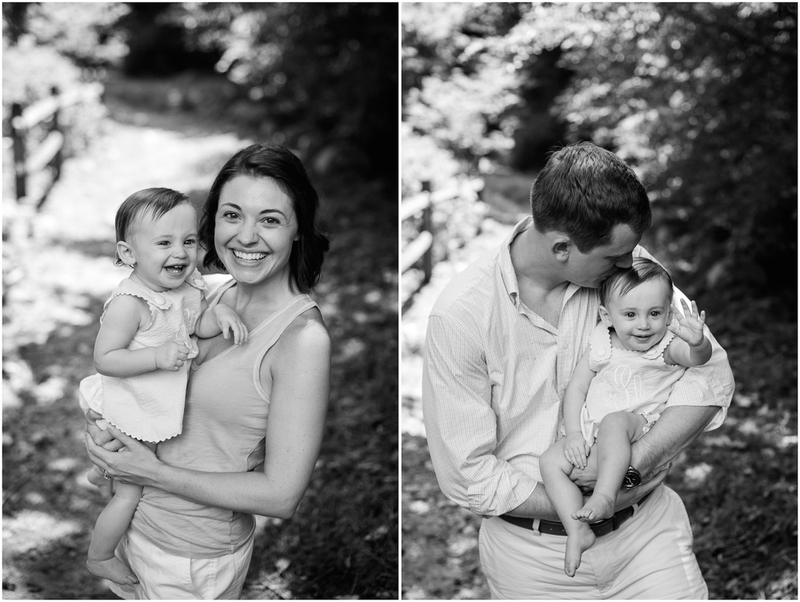 Here's a smattering from this past year's family sessions. I spent a recent afternoon with Jenn and Davis and their new fella Curren at their home on the Tar River. They're all pretty in love with each other and rightfully so. There's nothing better than when clients become friends and now that I've photographed this sweet, smart family several times and watched Carrie Anne grow from a tiny baby into a spunky little girl, I'm definitely calling them friends. I loved reconnecting with them the other week at their new home in Raleigh. This sweet couple welcomed baby Charlie just a few weeks ago and, naturally, are completely in love with him. Lucky me got to capture all the newborn goodness through my lens. My most favorite place to photograph a family is at home and I had the best afternoon a few weeks ago with these four at their new one. Where else can you play hopscotch, collect leaves and look for dead cicadas? I loved my time with these guys. I first met and photographed these folks last year at Topsail Beach when their little boy Davis was born. He's now a year old and full of personality and curiosity. I met them in Raleigh a few weeks ago and had the best afternoon reconnecting. The little man is five months today and it's blowing my mind. I want to remember everything that's so perfect and terrible and messy and precious about this stage of life. The rolling over, the sitting up, the two bottom teeth, the way he laughs at the dogs and lights up at his dad and me. Even the tears! I want to remember them too. It's all pretty beautiful. I photographed this beautiful, glowing mama at 37 weeks pregnant. She and her husband are anticipating their little guy's arrival any day now. Just gorgeous! I love this little family so much. Ryce and Matt welcomed baby John Matthew to the world and celebrated their first wedding anniversary just weeks apart. Talk about a beautiful year! It was such an honor and joy to document a slice of their sweet new chapter. There's just something extra brilliant about these people. Their home is so warm and so functional and so inviting that I itched to photograph and remember every corner. Jordan radiates a beautiful calm energy that her boys respond to and her husband Rocky is equally hands-on present. They live a rich life in downtown Greenville and being invited in to document their summer evening made my heart sing.